Do you remember how I told you about how old Tom Lee took his BIG family to the Adirondacks for a long, long break - a particularly well earned break for his wife I suspect ! And then how he beavered away to make enough chairs for them to sit on. 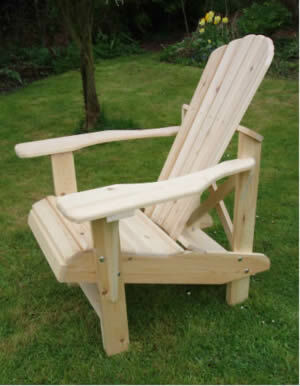 Then - many, many splintered bums later - he came up with the Adirondack Chair. Well the ‘Widemarsh Team’ and I have gone a little further than old Tom. 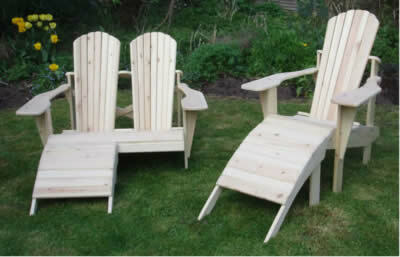 We’ve produced an Adirondack Family. 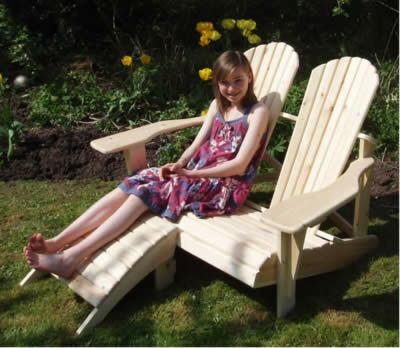 Well, it’s quite understandable that he stopped at perfecting one chair - his family would probably have stomped off home if he had started making benches, stools and higher chairs out of pallets too. Posteriors can only stand so much prototype testing ! 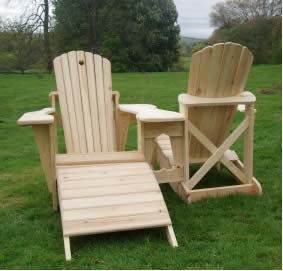 Incidentally you may have noticed a different ‘finish’ on our original chair to our new bench, stools and ‘High’ Adirondack. 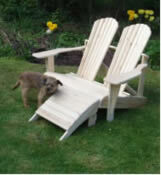 That’s because it’s the one Widemarsh made for us last year, and it’s weathered beautifully. O.K., O.K. 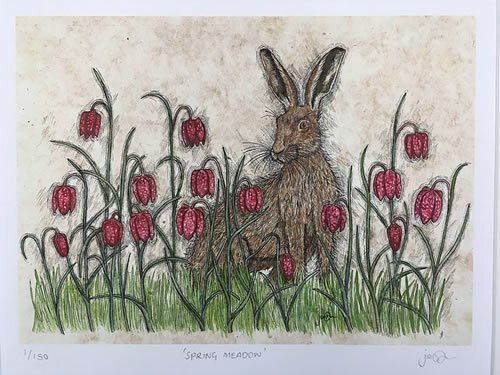 I know I promised to paint it, and I promised to do more ironing too - but I had my fingers crossed ! 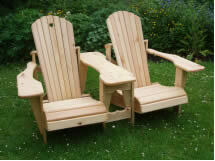 With all of the Adirondack family we will send out what we really believe is the easiest to use, most environmentally friendly and the longest lasting wood preservative - the 'Lifetime' wood treatment. It's so easy to apply, mix the powder with water, and just put it on. 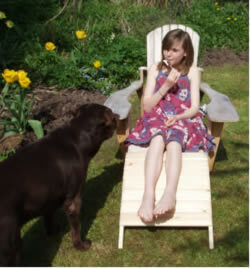 The new chair in our family is one we have designed for people who like to sit up that bit higher. 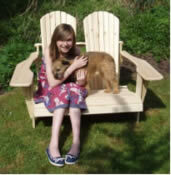 The seat is about 6” higher, and Joe is finding this chair is becoming his favourite. It is so much easier to get out of after a glass of wine - or two ! It’s designed with extra strengthening on the legs and, cross braces front and back. So it’s really, really stable. So’s Joe, most of the time ! 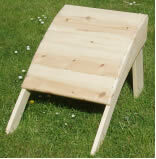 It can come with a specially designed stool too, but don’t rush me. Will get to the stools in a minute ! It’s a real dogs life ! 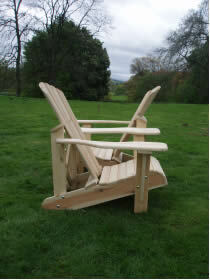 This genteelly elegant ‘Double Seater’ is far to refined to be called a BENCH ! seem to see two old friends sitting down together for a quiet, ruminative chat in the garden. However, I should tell you, these pictures in our garden did not come without some discussion ! Joe had decided that what was needed to really show the wonderful design off was a young model lounging on a bench nearly in her bikini. b) he became fully aware that if he really felt it essential, and went to interview some candidates, his voice would be raised a few octaves ......... permanently ! Courtesy of Daisy’s IT skills, not our hopeful “ David Bailey” ! ......... and sometimes you just want some company ! You try and get me down ! As with all our ‘Adirondack Family’ only FSC certified timber is used for our Double Seater. It’s carefully planed and hand sanded to a lovely smooth and natural finish just right for painting, but it does look quite lovely ageing ‘au naturel’. After all that digging, all that dog walking and all that Ice Cream eating it’s now time to throw off your shoes, and put your feet up ! 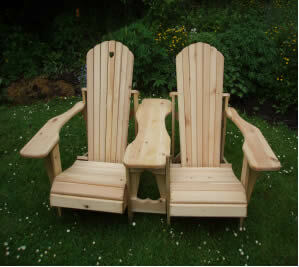 These “Love Seats”, ‘cos that’s what the Victorians called them, really do have a whole range of specialised uses. You cannot stop looking at each other. You simply can’t say another civil word to the Mother-in-Law. You love the Sun, but he’s thinking of his complexion. You want to keep your nibbles to yourself - and the wine. You are going to arm wrestle for who’s driving home tonight. You could challenge him to a game of chess - but he might win ! In actual fact, there is plenty of room for you each to have a bottle of wine each, and have your own nibbles - in fact plenty of room for each of you to have a roast dinner ! 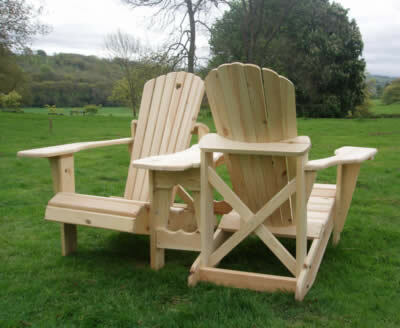 This ‘Love Seat’ really is a practical addition to your garden, you do not really need a table with one of these around, and they are just as comfortable as any other seat in our Adirondack Family. 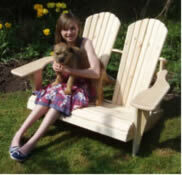 Think ‘Love Seat’ is probably the wrong name though ! Holding hands is all that is comfortably possible. But perhaps that’s just what the Victorians intended ! 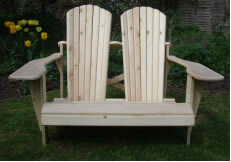 ‘Love Seat’ perhaps a bit too exotic for you ? How about some really serious sitting ! For eating, drinking, thinking - or just sitting ! Cannot quite think of the right name for this bench. Put very simply it’s a really, really comfortable way to take all the essentials into the garden for a bit of really serious relaxing. Plenty of room for books, papers, sandwiches, ice buckets and chocolates - just chill out and pretend you simply did not hear the ‘phone ! O.K., O.K. I know the lawn needs cutting. It’s been very wet, the mower wouldn’t start, it’s too heavy, the Daisies look too nice, the fuel can is empty, it frightens the birds ! 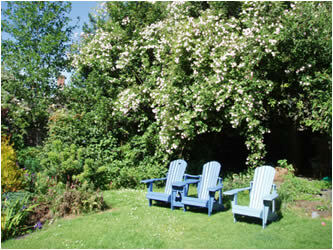 Oh, all right, a good book a cup of tea and a comfy Adirondack- who cares about the lawn ! Anyway, it’s man’s work, Joe can do it. Now I’m going to tell you about our Adirondack stools. 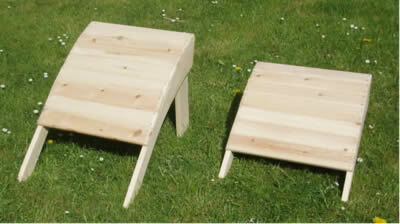 There is a beautiful curved, simplicity about these lovely stools. For some reason you cannot resist running your hands over them. 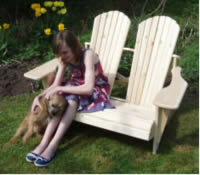 is designed for both the normal height chair and the ‘refined’ bench. 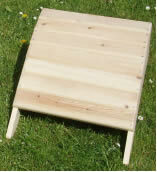 As always, planed and carefully hand sanded FSC certified wood is used to build our stools. 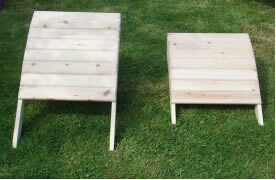 The Double Seater can take two stools, so you can both rest your legs while you nod off. 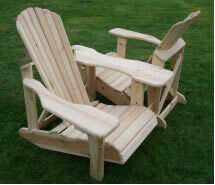 And you will, all of our Adirondack Family really are that comfortable. 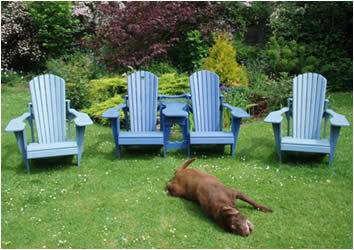 So very, very comfortable - as you can see from the half finished gardening jobs ! 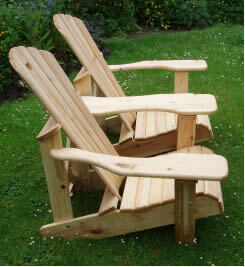 Well, there must be some catch about our hand built Adirondack Family. Perhaps it’s in the terribly complicated details about how to assemble them. Lay the back against the seat, screw in four screws, then sit down. 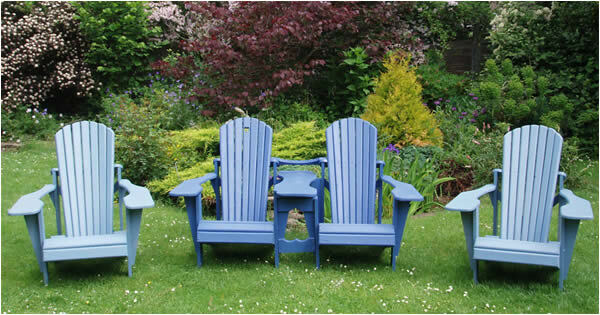 Unpack, place against chair or bench, then put your feet up. Well, on second thoughts - perhaps I will send everything out fully assembled ! 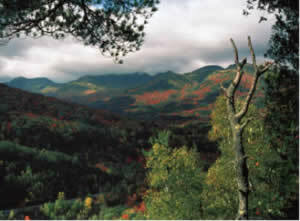 * You know how I was going on about how I must paint our Adirondacks one day ? Do you think Jude is laughing ? This is that wonderful ‘Himalayan Musk’ rose I went on about on the Arbours pages, can’t you just smell it ! One Saturday I spend all day staining our Middle Table Bench, letting it dry, then staining it again. Only problem was I used up all the stain, and the chairs still needed doing. Well I trusted him ....... silly ! If he says just one more time either “They’ll dry out darker” or “Nobody will notice“ or even “Variety is the Spice of Life” well...... I’ll not be responsible - but I bet a woman judge would let me off !